Okurr, here we go again. Time to cop the newest words to get all the tea you need. People will be wildin after reading this. Staying woke is the key to glow up the vocabulary for all those oof moments. 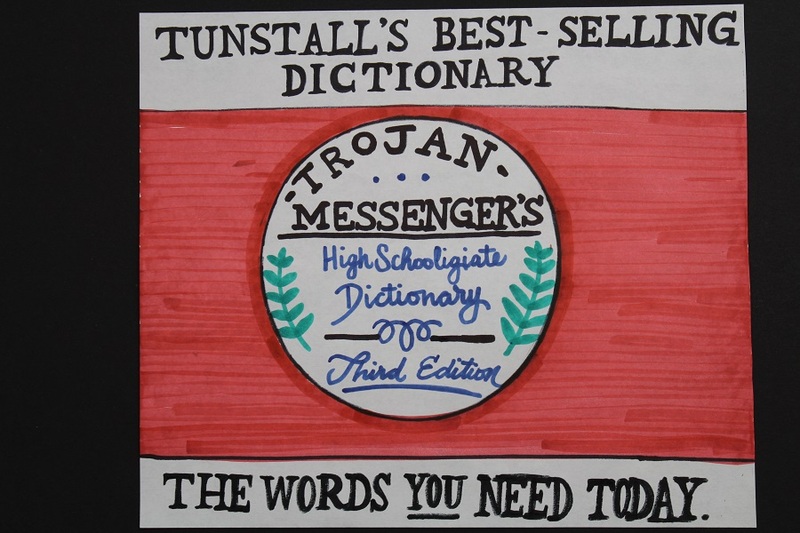 Click on these links to the Trojan Messenger’s highschoolegiate dictionary: Edition one and Trojan Messenger’s highschoolegiate dictionary: Edition two to catch up on more juice. Esketit. Bread: (n.) When a person has a test which the person knows they will get a good grade on. Interchangeable with win. i.e. Nick walks into the classroom on test day. “Let’s get this bread,” Nick says too energetically. Cop: (v.) To get something a person wants. Mainly associated with food. i.e. “I think I might go to Chick-Fil-A,” says Amanda. “Let’s cop some chicken minis,” said the starving Drew. Drip: (v.) To show off glamour or style of a possession, usually an outfit. i.e. Carter’s outfit drips way too hard. Finsta:(n.) A fake instagram, where people post ugly selfies or other photos they do not normally want associated with them. “Did you see Alisa’s finsta?” asked Jay. “Yea, that was one weird selfie,” said Hannah. Juice:(n.) Interchangeable with tea. A weaker drama that is still noteable. i.e. “Did you hear the juice about Daisy?” asked Margot. “Yea, she failed her midterm,” exclaimed Charlotte. Okurr: (interjection) 1. Some people say this out of the blue and does not make any sense. i.e. When at a friends one might randomly exclaim, “OKURR.”2. To say okay with a hard, rolling “r”. i.e. “Will you hand me the paper?” asked Julia. “Okurr,” said Aleise. Oof: (interjection) Used when something bad happens. i.e. “Kayla tripped down the stairs and broke her leg,” said Angel. “Oof,” said Amanda. Oofy goofy:(interjection) interchangeable with oof. Used when something bad happens but more cute. i.e. Mary spills all the paint on the floor. “Oofy goofy. That is not good,” said Lexy. Sketch: (adj.) to feel great amount of discomfort for something. i.e. The dark alley with bodies laying down looks sketch. Sus:(adv.) to be suspicious. i.e. If someone’s boo posts a picture with an unknown, too close for comfort person, it is sus. Sister:(n.) If the person breathes, they are a sister. i.e. Random pack of girls walk down a street and go into Starbucks. “Hey sister!! I want a white chocolate mocha extra whip,” says Dakota. “Everyone loves a basic sister,” replies the barista. Ship:(v.) to make an amazing couple. i.e. “ I totally, like, ship Elena and Damon,” shrieked Bonnie. “ Oh no! I ship Elena and Stefan, like, all the way!” shrieked Caroline. Stay woke:(v. phrase) When people are aware of issues of the current world or in general. Person walks into a room and talks, uneducatedly, about politics. i.e “STAY WOKE and know your facts!” interjects Marissa. Slight:(adj.) A way of saying something is easy. i.e. “That test was slight work. I didn’t even study,” said Joseph. Tea:(n.) Another way of referencing good drama. i.e. “Did you hear what happened last night?” asked Angel. “No, but spill the tea, sister,” said Kayla. Triggered:(v.) A state which a person feels so much emotion about a subject they think of another occurrence in their life. i.e. Nick slams into Matthew with a tray full of spaghetti. “TRIGGERED!” screams Grace. Wassup: (interjection) Acceptable, cool way of saying hey or what’s going on. i.e. “Wassup,” says any basic boy ever. “Nothing much,” says any other basic guy ever. WYWTA: What you wanna talk about? Now you can go along spilling the tea, triggering your friends, and finessing your enemies. These words are slight to use, so go get that bread, sister.